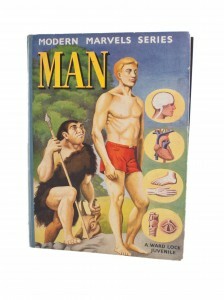 My friend Shirley sent me a British children’s book from the 50s that is (more or less) about human evolution. She thought it looked like perfect material for an altered book. A couple of months ago, a call went out from MarinMOCA for their annual altered book show. I got out my scissors. A little natural selection, anyone? I gutted the book. 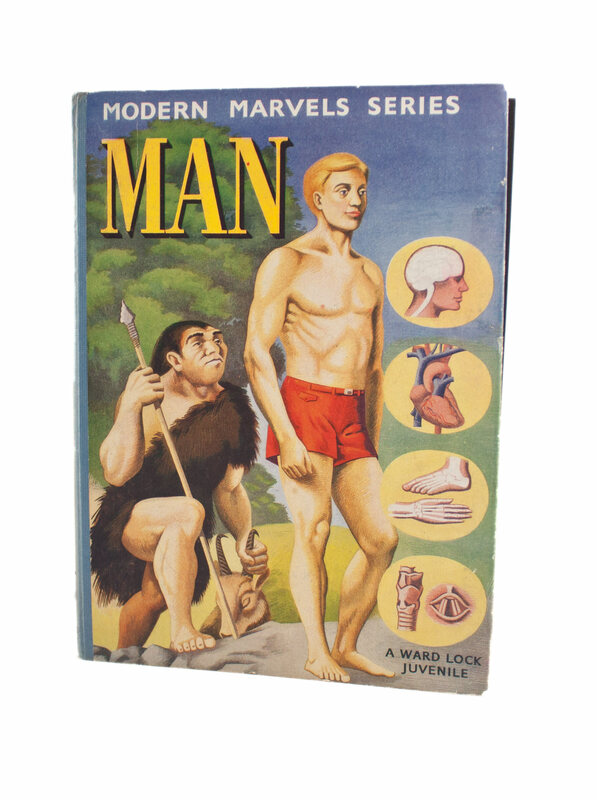 It has some basic human biology in it as well, but I decided to focus on the evolution bits for the sake of cohesion. 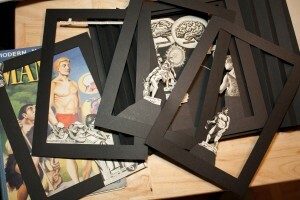 I mounted the cutouts with dry adhesive onto stiff paper. 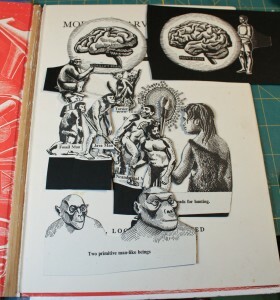 Then I arranged the chosen elements into layers. 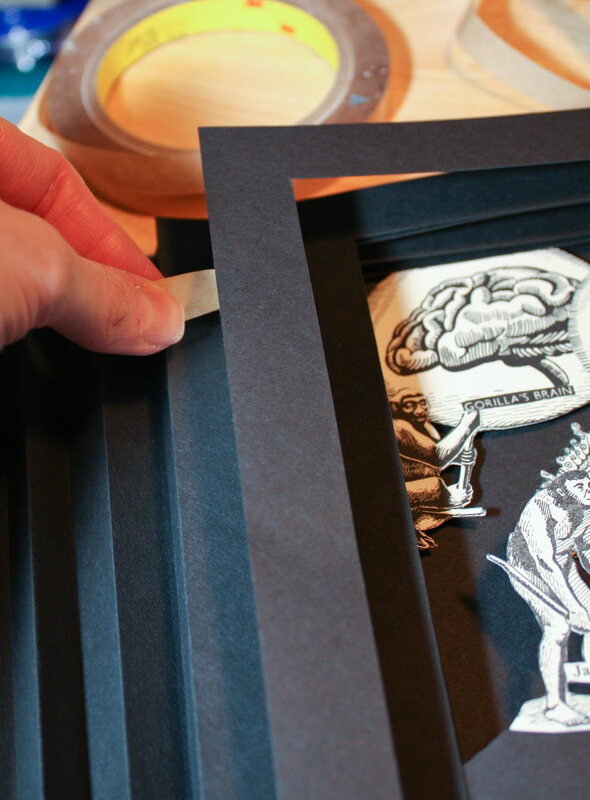 I cut out several identical black frames from stiff black Strathmore paper and folded two accordions from black German Ingres (the stuff is strong, but thin enough to fold into a nice pliable structure). 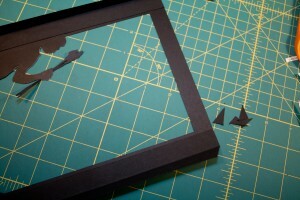 I anchored the cutouts onto the paper frames. Then I added hinges made of the Ingres onto the back of each frame. I used 3M 415 double-sided tape for mounting. Why use glue when it can be avoided? Especially when there’s a good archival alternative. On the up side, I’d also forgotten how theatrical and fun a finished tunnel book can be, especially a larger one like this. The finished tunnel is a tight fit into the original cover. If I’d had more time, I might’ve considered altering the spine to fit more properly. 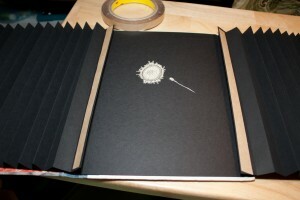 On the other hand, this way seems more in the altered book spirit. I’ve had a few original (not altered) tunnel projects sitting around half finished. Now that my appetite has been whetted, I want to make more tunnels! 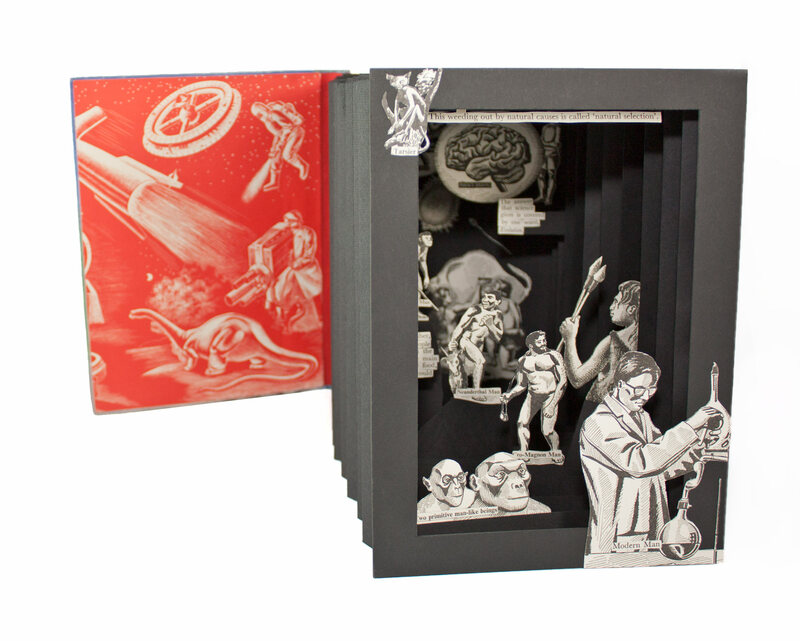 If you’re near the San Francisco Bay Area, consider checking out the 3rd Annual Altered Book Show at MarinMOCA in Novato, where Modern Marvels: Man will be on exhibit. It opens April 21. More details are on their website. Thanks. Next project… cleaning up the mess. Yike! Looking most excellent. Goodness you have talent. And patience. No…just mad. In all senses of the word. Looks excellent. 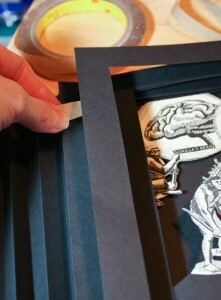 I very much like the method of mounting it on that stiff black paper. Makes it looks so much cleaner. 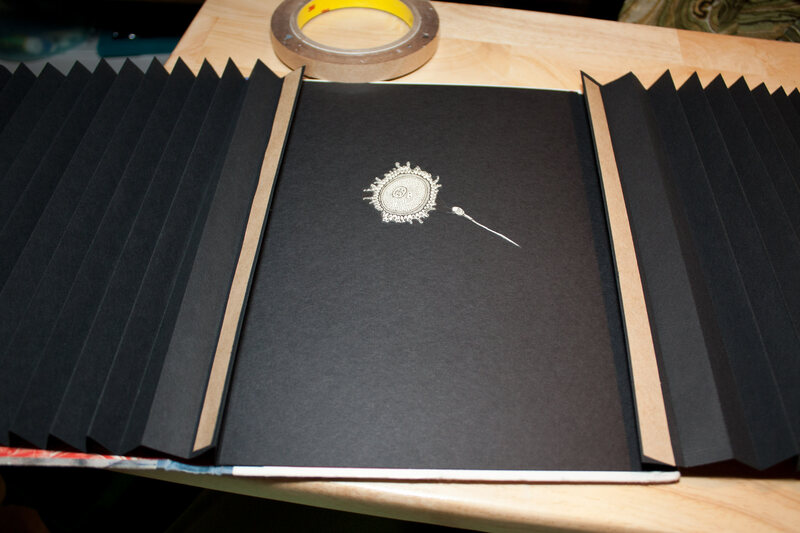 Good photo of the finished book, too! Thanks! And thanks for noticing the photo! I’ve been working on my book photographing and processing skills. It’s nice to have it noticed. I didn’t mention, but probably should have, that the very front panel is black museum board rather than the stiff paper. I wanted something sturdy for people to grab and pull. I do think it makes for a more solid tunnel. This is wonderful Ellen! Yet again inspiring me…now, where’s my scissors? Thanks Tan! And you inspire me!